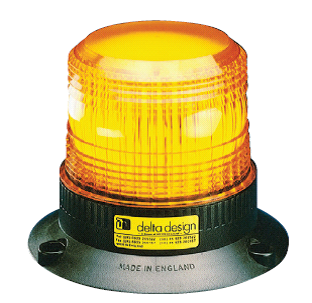 Delta Design RB Series Vehicle Signalling Beacons for Vehicle Signalling Applications. The RB Series of Vehicle Signalling Beacons are high output, xenon beacons for vehicle signalling applications and are designed for efficiency, low power consumption, durability and low maintenance. Available with permanent 3 point or magnetic mounting and a broad range of accessories, the RB Series are adaptable to a broad range of situations and requirements. – 3 point or magnetic mounting. – Dual voltage 12/24V version. – Multi-voltage versions for battery powered vehicles. – Application: Commercial vehicles, service vehicles, materials handling, and cleaning machines. – Temp Rating (degrees Celsius): -20 to +55. – Weight: 0.4kg (3 point mount base version), 0.82kg (magnetic base version). DLR401206 RB4XDV/6, 10-32VDC, 300-600mA, 4J flash energy, >50Cd(e) light output, 75fpm flash rate, (specify lens colour). DLR401206MAG RB4XDV/6MAG, 10-32VDC, 300-600mA, 4J flash energy, >50Cd(e) light output, 75fpm flash rate, (specify lens colour). DLR201215 RB2XDV/15, 10-33VDC, 0.75-1.5A, 6J flash energy, >60Cd(e) light output, 125fpm flash rate, (specify lens colour). DLR401002 RB4XMV/2P, 10-100VDC, 30-60VAC, 145-40mA, 1.5J flash energy, >18Cd(e) light output, 75fpm flash rate, (amber only). DLR401005 RB4XMV/5, 10-100VDC, 30-60VAC, 360-60mA, 4J flash energy, >44Cd(e) light output, 75fpm flash rate, (specify lens colour). DLFX9 FX9 steel guard for RB series accessories. DLFX60 FX60 magnetic kit RB series accessories. DLFX7 FX7 single bolt mount RB series accessories. DLFX13 FX13 Pole Mount Kit RB series accessories. DL900050 RB2XDV/15 xenon tube kit accessories. DL900051 RB4XMV/5 xenon tube kit accessories. DL900030 RB lens (specify colour) accessories.